Have you ever been in the mood where you want to watch something that will increase your knowledge on a certain topic, while at the same time you don’t want to watch a documentary? This can be somewhat of a difficult position to be in because, there really are not that many shows or movies that you can watch that actually hold your attention while reviewing some sort of history or biography of a person. Well, that is me at least. I am sure that there are some history buffs out there that will heartily disagree with me. For those who can somewhat sympathize with me, I have a show for you: Mr. Selfridge. This british show follows Harry Gordon Selfridge as he journeys to open up the first department store. The show documents the challenges he faces, societal pressures that he has to overcome, and reveals the true person that he was. The show is presented in a drama series so there is no documentary style of filming. In addition to the above reasons, here are 5 additional points that will convince you to take a look at the show. These reasons will give some spoilers, as a heads up. In the first few episodes, the viewer will see just how different life was prior to department stores. Women were supposed to be submissive, quiet people on the sideline, while the men did all the work. When the women did work, it was more menial work and less managerial work. However, Mr. Selfridge did not care about this. He wanted the person that was best for the job and, a lot of times, that was a woman. He did not hold back on treating them the same and gave them equal amount of responsibility. While this may not sound super interesting, put yourself into the shoes of the women back then. It was a game changer! Prior to department stores, clothes were not out in the open. The process would go something like this: you decide you want clothes, you go to your stylist, they measure you, make your clothes specific to your shape, size and weight, and then you pay them. There was no selection process on your end, and no trying it before you buy it. Department stores were completely different at this point. While we can look at department stores nowadays and see the success that was inevitable, back then it was much harder to convince people of this. They had their way of doing something and Mr. Selfridge would encounter multiple roadblocks that these people set up. In order for Mr. Selfridge to overcome these barriers, he would face financial backers pulling out, riots, marital pressures at home, other love life interests at work, and the list continues. Mr. Selfridge was pushing the status quo during this time. No one had ever considered doing what he was doing in the shopping industry. It was a very boring reality to be in fashion, which is hard to comprehend nowadays. However, back then, everyone wore the same style, same color, and same brand. It was mundane. Mr. Selfridge shook up the entire industry so that people were able to touch the fabric before buying it, they could hold it up to themselves to see if it worked with their eyes, and they were able to get multiple colors of it. 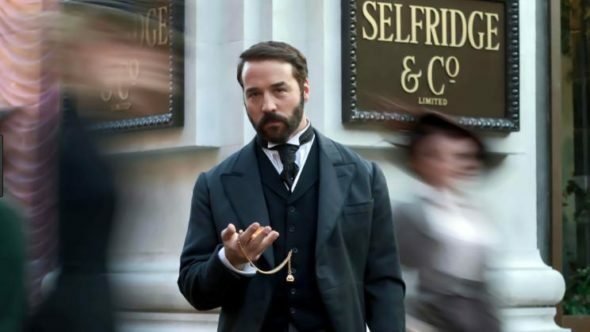 I have to admit, prior to watching this show, I did not know about Mr. Selfridge. I had seen his stores, but never had known the back story. This reminded me of something that is easy to forget: we stand on the shoulders of giants. People’s blood, sweat, and tears have all gone before us to build the world that we currently live in. It made me appreciate all the hard work that Mr. Selfridge put in to change the world. Overall, this is a great show. It is family friendly and can be watched if you are an Amazon Prime member. The challenges that he faces are somewhat shocking, but the way he solves them are inspiring. Mr. Selfridge is a show that will have you learning something new every episode, but also enjoying the pros (and cons) of a good drama TV-show series. Season Four of How to Get Away with Murder Available on Netflix! ← In The Mood for a Movie Throwback Night? Here are 9 Titles to Put on Your List!